I should say upfront to my American friends that it's still to early to rush out to your local Wal-Mart and start looking for the WM exclusive Wave 14 of DC Universe Classics. This advance appearance of that wave's Collect and Connect figure, the terrifying Ultra-Humanite, isn't the product of any amazing retail find - it's the result of me caving in a moment of weakness and buying him on eBay from Hong Kong. In my defense, I shall offer weakly that it was a very cheap Buy it Now, that I didn't seek him out but rather just stumbled upon it, and hey, I'm a pretty big fan of Superman's original arch-foe, okay?? I don't have anything to compare it with at the moment, but any concerns I had about buying what is quite possibly a factory reject were unnecessary - there's nothing I can really fault. Sculpt and paint all look top notch, and he even has his computer console accessory. 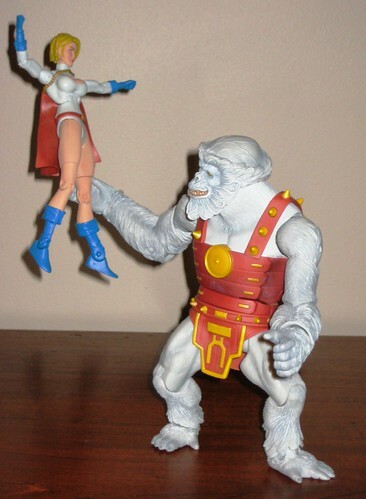 Ultra-Humanite seems to share Gorilla Grodd's arms, but everything else here is new - including legs with articulated knees and ankles which makes a number of different poses possible. Perhaps the one issue with this particular figure I've bought is that the knee and ankle joints are rather loose. It's not enough to impact on him standing, but I normally find the joints on CnC parts are very stiff, so this is something different. This really is an exciting choice for a Collect and Connect, both in terms of character selection and quality. He's a great JSA villain, an Earth Two character, and he looks great! This sort of diversity in CnC choices is very important in ensuring that the DCUC line really does cover the entire DC Universe, so I'm very pleased to see a character like the Humanite getting his turn! 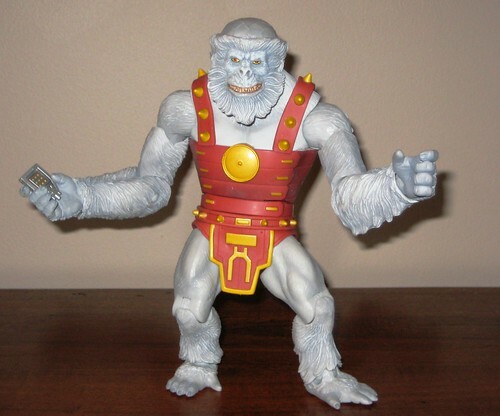 This big white ape is so amazing that I have no qualms about collecting him again piece by piece as my DCUC Wave 14 collection comes together - which won't happen by paying scalpers on eBay. I'm very fortunate to have friends on a couple of forums Stateside that have banded together to help us "internationals" get access to these exclusives at reasonable prices. Collectors unite! You can see more pics on Facebook, discuss this at the AFB Forum, and comment on this post to enter the September AFB Comment of the Month Contest. I've been seeing several Ultra-Humanite figures in our local hobby stores here in the Philippines as well. He's been going for about $75 US or so, as are many of the DCUC CNCs. I like how it looks, but I can't bring myself to get it for that much money. Darkseid, maybe, but not this. Hah! I saw those ebay auctions too! What a great looking figure. Well done Andy and DCUC! Ooooooooo, I'm super unreasonable and jealous now. I have wanted an Ultra-Humanite for sooooooooooooo long, it's unreal. When I was a kid, er, young teen, and was collecting Super Powers, I SO thought that UH could make a very appealing addition to the line. There were so many characters that my young mind thought just HAD to be made. And, then they weren't. But, now they ARE being made by Mattel. And it makes me giddy. Hey Andy, speaking of Wal-Mart Exclusives, I've been meaning to tell you because I know you're a big Aquaman fan. At one of my local Wal-Marts they have the recently-released Wal-Mart Exclusive DCUC Aquaman and Black Manta 2-Pack marked down on clearance to $22 USD. They only have one left, but the set is in great condition, with minimal to no shelf wear. Less excited about the rest of the wave (cept Kammandi). Glad to see he looks so good, shame about the loose joints. Seeing what Ultra looks like complete. makes me want to go and get wave fourteen when they finaly show up at wal marts here in the states . for Mattel nailed him . I never had much of an imprint in my brain of the character until recent years, but the figure looks like a must-have for me! It seems the FIGURE similiar to the character in the movie "Planet Of The Ape".just this is white. Just my point of view & no offend.Anyway i like it.